When you travel to a paradise island your main expectations are sunbathing, swimming, snorkeling and relax… In Wakatobi you can get it all, but this group of islands in Southeast Sulawesi – Indonesia, surprised me in a different way. I traveled to Wakatobi for the nature and ended up falling in love for the people. 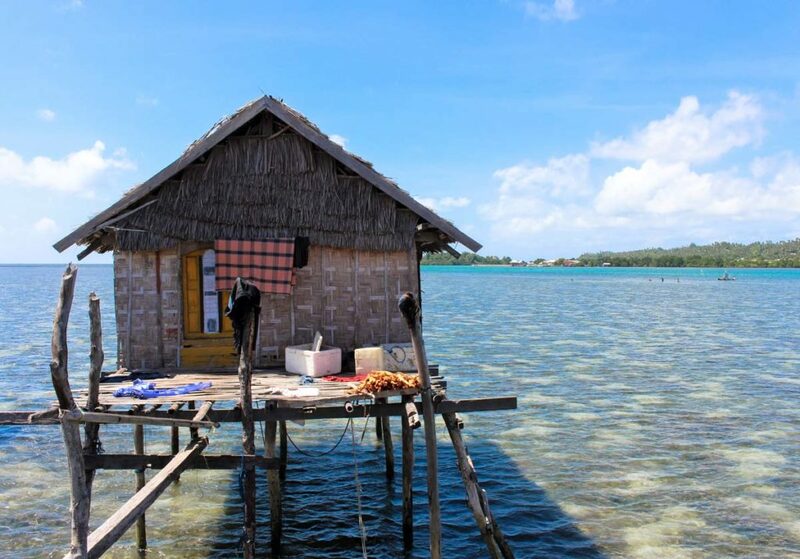 Specially the ones from the Bajo Tribe, a sea nomad tribe who built their homes in the middle of the sea. The houses are simple, built on wooden stilts, floating on the light blue water. It’s beautiful to look at them, to admire such a fragile structure resisting to the tropical weather and being used as a home by such kind and smiley people. Bajo Tribe, also called as sea gypsy, have lived in the water for centuries, they are outstanding free-divers, sailors, fishermen, and they have the happiest kids I have ever met. 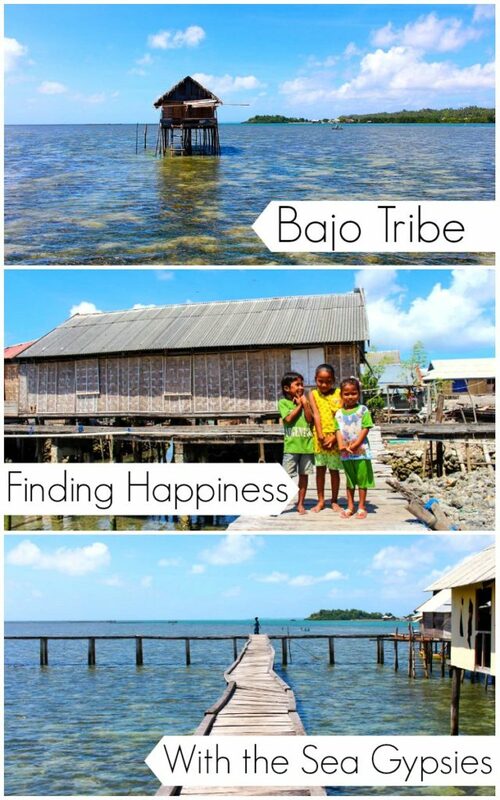 The Bajo Tribe is famous on the internet with beautiful photos of floating houses and the kids paddling the canoes. But the truth is that only a small amount of travelers have the opportunity to travel to Wakatobi and visit the nomads of the sea. Before visiting the village, I had mixed feelings. I was really excited to see the houses and meet the locals, but I was afraid to be disrespectful, to be an intruder taking photos of their homes and kids, like a tourist that goes to the zoo for the first time. I didn’t want to annoy them, or make them feel like an object. That’s why when I got out of the boat I had my camera down and followed the less crowded path through the Bajo village. Step by step I got inside that amazing world and smile by smile I got the courage to got my camera and start shooting. First the houses, then the boats and suddenly I had some kids running on my way and screaming “photo, photo!!”. That’s was the signal I was waiting for, I grabbed my phone and my first instinct was “let’s take a selfie!”. I guess they are used to be photographed, but to be in a photo with a foreigner, that surprised them. We squeezed our faces and snap! We had our icebreaker selfie, and from that moment they became my personal guides in the village. We kept walking, jumping from one walkway to another, taking pictures, laughing… The oldest one was a bit shy, she kept holding on my shorts, but every time I tried to take a photo of her, she stepped back. Her yellow dress made her brown skin even more beautiful, with dark penetrating eyes and a huge smile. I believe good trips are made of moments and people, and after playing with the kids I was lucky enough to be invited to enter in one of the houses. It was my chance to learn a bit more about the Bajo Tribe, so I took my shoes off and entered in this tiny home, where 4 beautiful women were waiting for me. So glad that at that moment I was with Ferina, a member of Tourism Indonesia who was traveling with us, she helped me translating the conversation. Bajo people speaks a local dialect, but many of the adults speak Bahasa too [Indonesia language]. Between laughs, they explained to us that the Bajo life is still 100% connected with the sea. Fresh fish and squid are daily food, also the goods they trade to buy rice and other product from the small shop in the village. For the Bajo Tribe life is tough and simple, but somehow it feels happier than the crazy life we have in our so-called modern world. I’m so thankful for being invited to their home. A quick conversation that sparked some deep thoughts. 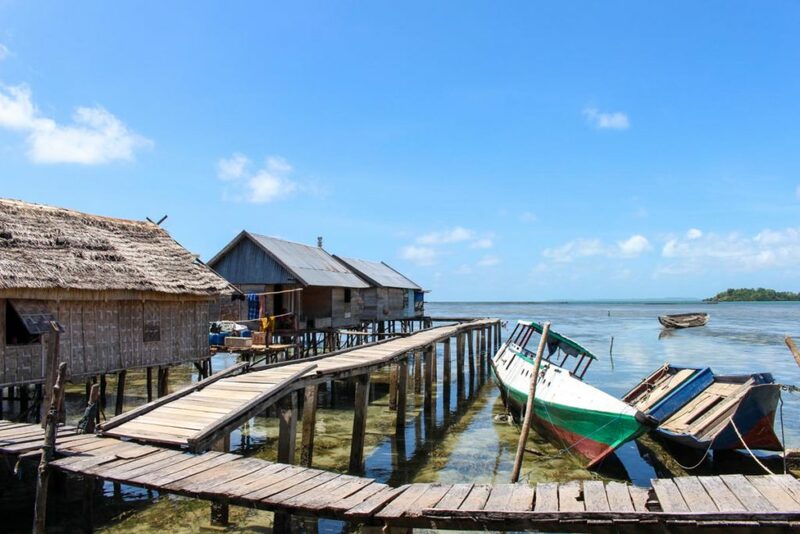 The Bajo village in Wakatobi is not only a unique and picturesque place to visit. It’s a learning experience, where I discovered that happiness has nothing to do with possessions. That a simple life gives you the freedom of smile. When we arrived at the Bajo Tribe many people on our boat felt sad for them, for the lack of clothes [yes some kids were running naked around the village, adorable], the tiny houses… But what they have is far more important, they have nature and happiness! After the visit I felt pity for us. The crazy westerns covered in material stuff, working hard to pay the bills, losing our happiness on the rat race… I’m not saying that we should give up on everything and become a Bajo [believe me, we won’t survive, we don’t have skills for that]. But we should definitely rethink our way of living. Rethink our lack of smiles, our frowny face when the internet doesn’t work, because the waiter is taking too long to bring our coffee, or because we can’t buy a new pair of shoes. Has been almost three years that I’m in a process to become more and more minimalist, trying to give more value to experiences than possessions. The Bajo people reassured my decision, and after that visit I decided to have a new target in life: to Smile more! Every day I’m trying to put a nice and truly smile on my face. Share it with my friends, family, and everyone that might cross my path. 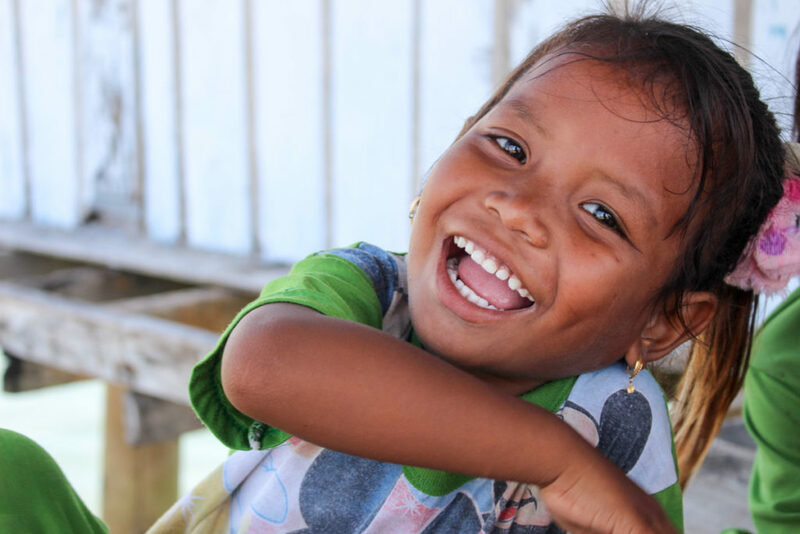 Be happy was the beautiful lesson I learned from the Bajo people in Wakatobi. Live a simple life and be generous with smiles was what the kids taught me under the sun… Now I feel the need, and the duty, to share it with you! From now on, try to be simple and happy… You will feel the change in your heart! Where do the Bajo people live? You can find the sea gypsy community in many regions of Indonesia, The Philippines and Malaysia. The Bajo village I visited is located in Wakatobi, a group of 4 islands in Southeast Sulawesi, Indonesia. How to visit the Bajo Tribe? You need to fly to Matahora Airport at Wangi-wangi Island. There are daily flights from Jakarta, Bali and Makassar to there. From the island you need to get a boat (can a be a tour operator or a fisherman) and cruise all the way to the Bajo community. There are three villages in the region, we passed by two and stopped at the farthest one. The boat trip to the Bajo tribe took almost 2 hours. 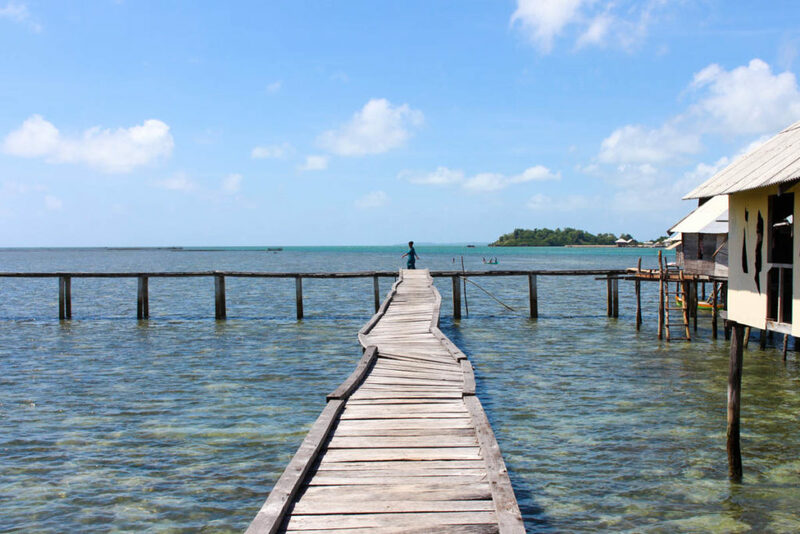 Where to stay in Wakatobi when visiting the sea nomads? 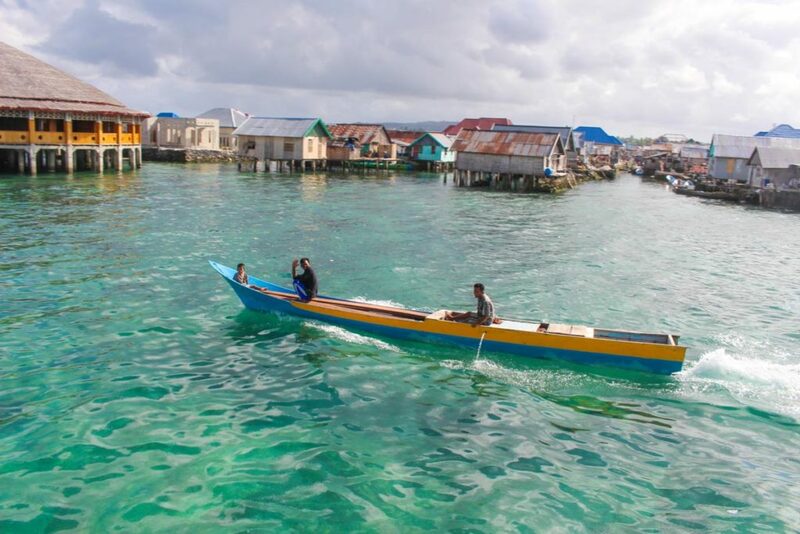 To visit the Bajo people you need to be based on one of the four islands of Wakatobi. There are many options of hotels, guesthouses and dive resorts. To search and book the best accommodation in Wakatobi use Agoda or Booking, these are the two websites we use and recommend. How much you need to pay to visit the Bajo village? Good question! I have no idea. My visit was organized by the tour operator that took us to some dive and snorkeling activities in Wakatobi [all the details from my underwater adventure will be on the next post]. Talk with your hotel and I’m sure they can arrange the trip for you. For the Bajo people you don’t need to pay anything, show appreciation and respect to them, that is priceless. Keep smiling, enjoy every second of your trip to Wakatobi! Find happiness for being surround by nature and saltwater! PS: A big thanks to Indonesia Ministry of Tourism for inviting me for this happy encounter with the Sea Gypsies in Wakatobi. This is a really inspirational post and the children’s smiles are infectious 🙂 It’s so nice that you were invited into their home and got a taste of the local life. You’re very right – Westerners definitely need to appreciate the simple life a bit more! Glad that you enjoyed reading the post. Visiting the Bajo Tribe was an unforgettable experience! The Bajo Tribe and all the sea gypsies in Indonesia are recognized as citizens, they are Indonesia and they are part of the public programs to protect the Natural Marine Park in Wakatobi. There is a small school in the village and a healthy clinic, so I guess they are being “looked after” by the government. Looks like you had a very beautiful and interesting experience in the village. I love the look on their faces when you show them the photos. I would like to visit those places. The kids loved to see their photos, sometimes felt like they didn’t know how beautiful they really are. I saw sea gypsies in a few different countries. Hardy people! Many live in paradise too, with crystal clear waters and palm trees swaying in the breeze. Even though they live in hard conditions during monsoon season these folks always seem to be cheery, happy and grateful. Awesome lesson for all of us. The hard conditions of the Indonesia weather and those tiny fragile houses stayed in my mind for days. I still can believe how they survive during the monsoon. But one of the men from the village told me that “Bajo people never give up”, so I guess that’s another lesson we need to learn from them. This is simply fascinating, inspiring and beautiful! I LOVE seeing local cultures and the Bajo tribes seem to be a fantastic way to do that in Indonesia. The floating villages reminds me of the ones in Vietnam…except these ones look STUNNING on the clear, blue water! The Bajo Tribe was a cultural immersion, love it. When in Vietnam we thought about visiting the floating villages there, but didn’t have time. Hope we can do it in another trip. OMG some of those photos are too cute for words 🙂 You had such an awesome and authentic experience – nice one! Have pinned to our favourite Southeast Asia travel board. If you guys come back to Indonesia, put Wakatobi and the Bajo tribe on your itinerary. I’m sure you will love to have fun with those kids. This looks like a beautiful destination with incredible people. Definitely my type of place! Hi Cary, thanks for stopping by! Thank you for sharing such an inspirational story. How fascinating that you were able to meet the Bajo people. Great reminder about the simple joys of laugh. A smile…and open spirit. Great post! A simple life and good laugh are precious nowadays, specially when many people believe that happiness can be bought as an object. Wow, what a beautiful story. Your honest account took me along for the ride. Those precious children with their smiling faces and the opportunity to visit a local home are unforgettable experiences. I had similar feelings when I visited a tiny community in Haiti. Isn’t funny how so often people who “appear” to have so little can give so much in return? You are so right Jackie!! 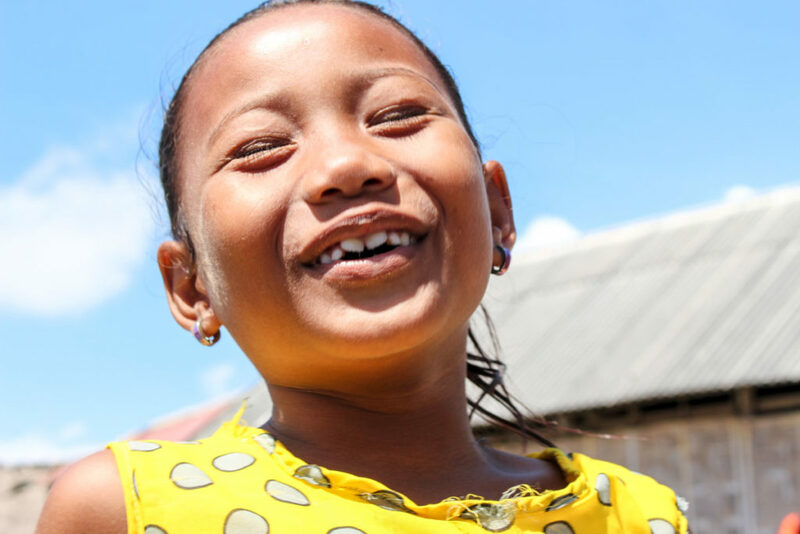 Even in a harsh reality those kids and the Bajo people give so much happiness and joy. An experience that I want to keep in my heart forever. I want to add also that the happiness is reciprocal in nature. We make them happy and they make us happy too. I love interacting with the locals to every place I go to. I play chess with them, I teach them new origami, and I eat with them too (in invited). Thanks for sharing this post. Looks like you had a lot of fun with the Bajo kids. I’m the same as you, I love to interact with locals, it gives you a completely different perspective of the city and country. I’ve been to some areas with houses on the stilts – I’d love to visit this one as well. As for the people – you’re right, people make you like or dislike the place. So nice to know that you have already visited some sea gypsies, it’s an amazing experience for sure. What an amazing experience! I have seen many photos of the village and it is a place I have definitely wanted to visit. I truly respect how you handled yourself around the locals and it shows in your pictures how they appreciated the respect. I hope to have the same when I finally get to visit. The Bajo Tribe is lovely, you will see! If you travel around Indonesia, make your way to Wakatobi, it’s a lovely place and still so authentic. 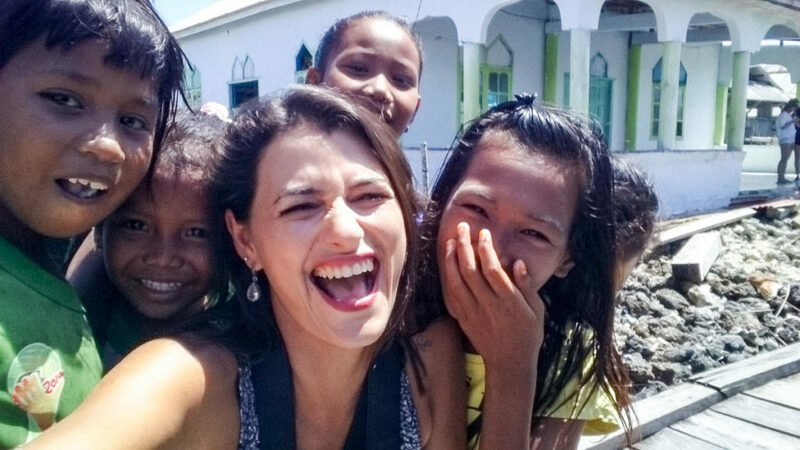 I’m sure Megan, you would love Wakatobi and the Bajo Tribe. It’s a unique experience, a travel opportunity like no other. Their happiness can’t be counted. Blessed are the Bajo Tribe to have this kind of nature. They lived very simply yet filled with all source of happiness and love. II’d like to venture this place someday. Thanks for the tour. Agree with you: blessed are the Bajo Tribe! Happy to know that you have visited the Bajo Tribe! It’s definitely a lesson, their have very simple lives, but for me it was an opportunity to rethink about my values, my possessions and what I want for my life, things or happiness?